Could it be? CoverGirl's Catching Fire Capitol Collection? (Try saying that 5 times fast!) 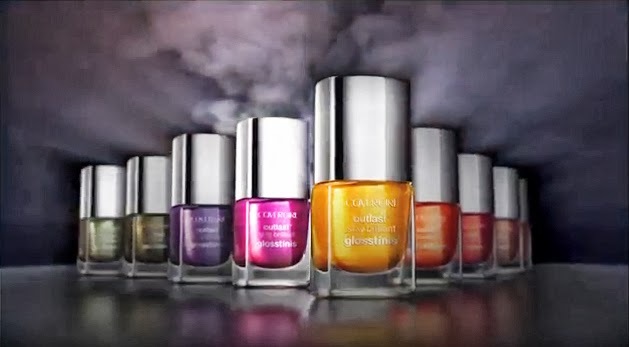 CoverGirl released a Catching Fire Capitol Collection commercial with some sneak previews of a few more Capitol Color Collection looks, and some of the alleged products. You can view the full commercial here. If we can trust what we see in the teaser commercial, it looks like there will be at least 9 polishes, if not one for each district for a total of 12. 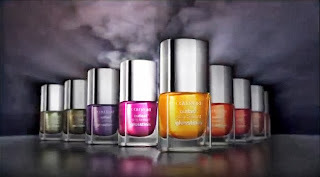 The commercial shows the polishes as CoverGirl Outlast Stay Brilliant Glosstinis, which are mini versions of their Outlast Stay Brilliant Nail Gloss. I'm not sure why, but it seems like CoverGirl is putting out their limited edition polish collections as Glosstinis, rather than full-size bottles. Less risky? Easier to package? Either way, it looks like a pretty decent range of shades, don't you think? Judging from the pic above, (which isn't tres clear,) it looks like the Capitol Collection features a bunch of frosty/metallic finishes. That's a trend this fall, but it's hard to say if ALL of the polishes will bear that finish. Guess we'll have to wait and see when they release some official images. Check out this post to see the official looks from the Capitol Collection, updated as CoverGirl releases them. What are your first thoughts about this collection? Like/Love/Loathe? Let me know!